The preassembled Linear Units from item save customers valuable time. In fact, they can be put straight to use without any additional work. Naturally, the preassembled Linear Units cover a broad range of customer applications, meaning that any production requirement can be met with no need for compromises. 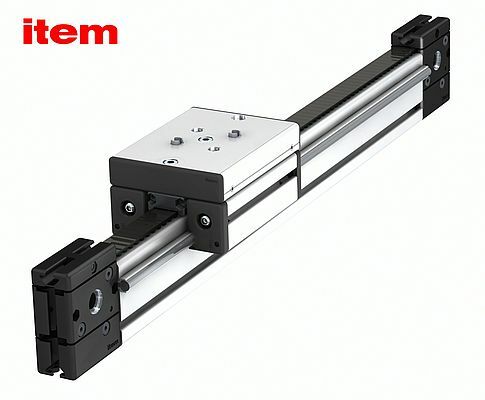 The new Linear Units consist of perfectly coordinated linear slides combined with a range of drive technologies. They deliver reliable and precise power transmission in process automation. The new compact Installation Column puts all the necessary connections in one central place! The item Installation Column is the perfect solution for fitting out production areas with connection points for power, compressed air and network access. It keeps everything close to hand and clears the way for improved productivity. The stable column incorporates two large cable conduits. Sockets, switches and jacks can be simply clipped into the column openings. Two Line 8 grooves on all four sides offer ideal attachment points for light fittings, a Pivot Arm and other accessories. The Work Bench System is the basis for comprehensive ergonomic design in working environments. It takes a great deal of strain off personnel and helps them keep fit and healthy.